“It wasn’t a very good alert….” brags the other jackboot about the drug dog “giving them permission” to search this man’s vehicle. He was likely about to confess to just how arbitrary their decision was in violating this innocent person’s rights, when he spots the camera. “Hey Jim……” and they realize they’ve been bamboozled. Watching this video is incredibly grounding, we can see just how far the US has progressed into a totalitarian police state. These Stasi checkpoints are NOT for your safety, they are to condition innocent people into acquiescing to state intimidation. 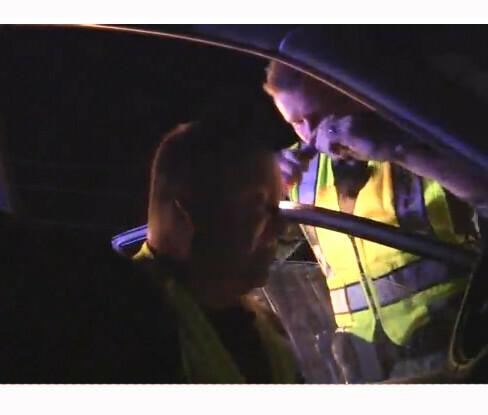 If you doubt that claim, research how many of these “DUI Checkpoints” actually catch people that are DUI. 32 citations were issued: Two child restraint device citations, one DUI, 10 citations for violations of the registration law, four citations for violation of the light law, one revoked/suspended driver’s license, six financial responsibility (no insurance), six other driver’s license law violations, and two safety belt law violations. Only one DUI arrest was made. One out of 250. 250 people were stopped, questioned, their rights violated, and faced potential and real harassment so this department could be 0.4% effective at stopping drunk driving. The police state expanding around us is grotesque and vile, and worse yet is the fact that it is accepted by most Americans because they think it is necessary for their safety. We must continue to expose the tyrants, we must help to lessen the ignorance in ourselves, and those around us. Americans accept this tyranny because it has been incrementally phased into their perception. If they could step outside of their lazy-boys and football for just a minute, they’d be able to see reality. The reality is that we are being enslaved by a system of taxation and oppression. The only way out of this system is knowledge. We, the people, have no way of defending against drones, tanks, tomahawk missiles, etc., so violence would prove futile and only convert tyrants in to martyrs.